Brasil Divided into its Captainships. 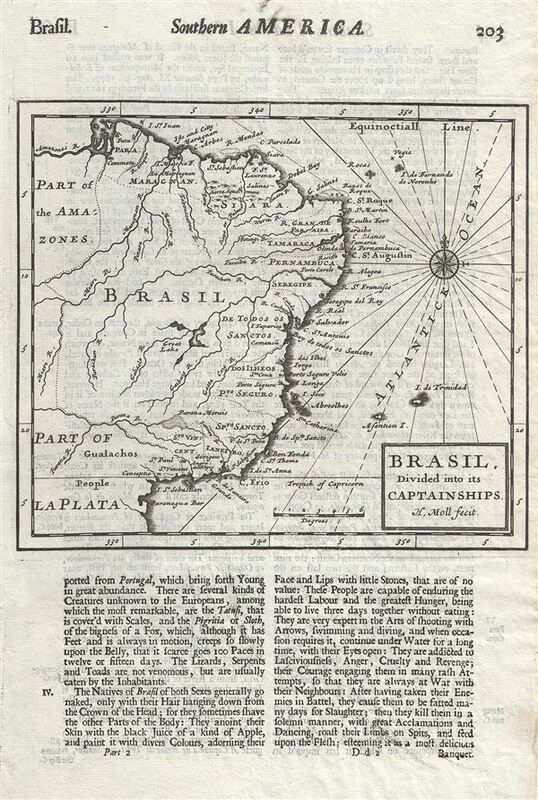 This is a scarce 1701 map of Brazil by Herman Moll. It depicts Brazil and eastern South America and covers from the mouth of the Amazon south to Paranagua. It depicts the various captainships including Para, Maragnan, Siara, Rio Grande, Paraiba, Tamaraca, Pernambuco, Seregipe, Bahia (de todos os Santos), Isleos, Porto Seguro, Spiritu Santo, Rio de Janeiro, Santo Vincente and the Amazon basin. Though by this point in history, the general outlines of South America are well established by regular circumnavigations of the continent, the interior is entirely speculative. The map notes several towns, cities, lakes and rivers throughout, with beautifully rendered mountain ranges. This map was issued in Herman Moll's 1701 System of Geography.